"The Hottest Little Paper In Town"
Our goal is to promote laughter while connecting customers directly with your business. Printed on the 1st and 3rd Wednesday of each month, the Orange Peel Gazette is filled with amusing stories, jokes, trivia and puzzles that are read by thousands of people each month. 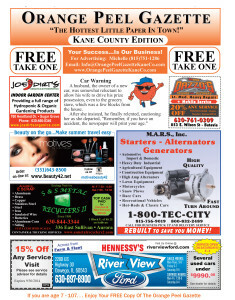 Companies have found our paper to be a proven and effective way to advertise their business to the local community. Over 300 locations in Kane County distribute our free publication including restaurants, banks, tourist centers, hair salons, supermarkets, convenience stores, car dealerships, golf course, medical facilities and other local business. Thank you for visiting our website and for reading our entertaining community paper. If you would like to advertise Click Here or Contact Us.